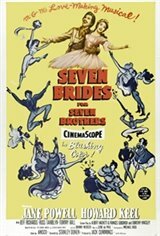 Based extremely loosely on the Stephen Vincent Benet story Sobbin' Women, Seven Brides for Seven Brothers is one of the best MGM musicals of the 1950s. Most of the story takes place on an Oregon ranch, maintained by Adam Pontabee (Howard Keel) and his six brothers, played by Jeff Richards, Russ Tamblyn, Tommy Rall, Mark Platt, Matt Mattox, and Jacques d'Amboise (it is no coincidence that five of those six boys are played by professional dancers). When Adam brings home his new bride Milly (Jane Powell), she is appalled at the brothers' slovenliness and sets about turning these unwashed louts into immaculate gentlemen. During the boisterous barn-raising scene, the brothers get into a scuffle with a group of townsmen over the affection of six comely lasses: Virginia Gibson, Julie Newmeyer (later Newmar), Ruth Kilmonis (later Ruth Lee), Nancy Kilgas, Betty Carr, and Norma Doggett (yep, most of the girls are dancers, too). Yearning to become husbands like their big brother, they ask Adam for advice. Alas, he has been reading a book about the abduction of the Sabine Women (or, as he puts it, the Sobbin' Women); and, in order to claim their gals, Adam explains, the boys must kidnap them--which they do, after blocking off all avenues of escape. Vowing to remain on their best behavior, the boys make no untoward advances towards their reluctant female guests--not even during one of the coldest winters on record. Comes the spring thaw, the angry townsfolk come charging up the mountain, demanding the return of the stolen girls (who, by this time, have tamed their men). A happy ending is ultimately had by all in this delightful if politically incorrect concoction.